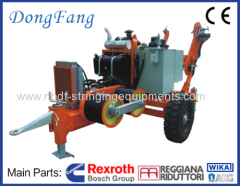 Cable Tension Stringing Equipments are used for overhead Transmission Line Stringing and Maintenace. 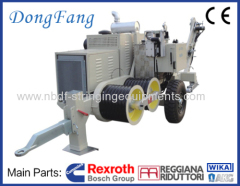 The equipments are composed of pullers, tensioners, motorised winches, stringing blocks, anti twisting braided steel rope, hydraulic compressors etc. 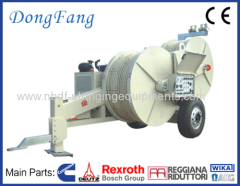 Ningbo Dongfang Machinery of Power Co., ltd. is the leading and biggest manufacture in China. 30 Ton Tension Stringing Equipments are used for 1000 KV overhead power line 4 conductors stringing project. The max. conductor size can be 48mm. 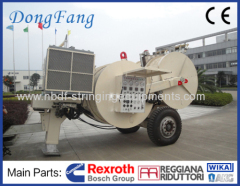 20 Ton Tension Stringing Equipments are used for overhead power line 4 or 6 oconductors stringing project. It is used for 500 KV , 750KV, 800KV line. 16 Ton Tension Stringing Equipments are used for overhead power line 4 conductors stringing project. It is used for 400 KV or 500KV Transmission Line. 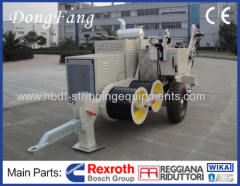 9 Ton Cable Tension Stringing Equipments are used for overhead power line 2 conductors stringing project. It is used for big conductors stringing up . 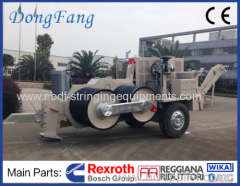 8 Ton Cable Tension Stringing Equipments are used for overhead transmisson line 2 conductors stringing. It can be used for diameter up to 40 mm Cable. 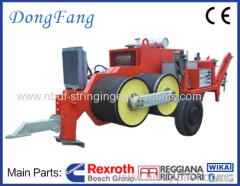 6 Ton Cable Tension Stringing Equipments are used for overhead transmisson line 2 conductors stringing. The set can be used for diameter up to 32 mm. 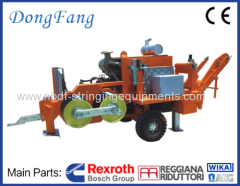 4 Ton Cable Tension Stringing Equipments are used for overhead transmisson line single conductor or big pilot wire rope stringing. 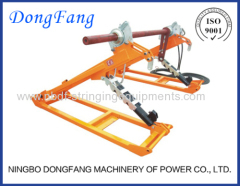 3 Ton Cable Tension Stringing Equipment include 3 Ton puller with Cable Tensioner, is mainly used for overhead single conductor or OPGW stringing. Hydraulic Reel Elevators are used for supporting and controlling the conductor reels (drums), during the transmission line stringing operation. 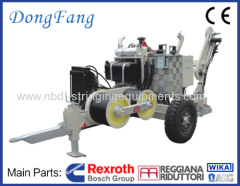 Ningbo Huaxiang Dongfang Machinery prducao e fornecimento Equipamentos para lancamento de cabos electricos. 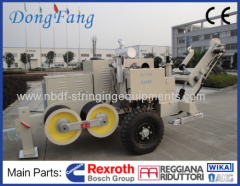 Overhead Cable Tension Stringing Equipments are used for power transmisson line conductors stringing. It can be used for cable diameter up to 40 mm. 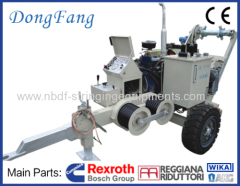 Group of Tension Stringing Equipments has been presented above, want more	Tension Stringing Equipments and Cable Tension Stringing Equipments, Please Contact Us.